I was born and raised in Mexico. That is the first thing I say when people ask where my love for food comes from. Although I think that should explain most of it, it usually doesn’t. In hindsight, I think my interest in food built up as I tried to deny it. As a political analyst, I left things related to food for my spare time. As my husband and I started to grow a family, I began to think he was a macho man in disguise, who wanted a wife in the kitchen, since he insisted time and again I quit my academic path to jump into cooking. Things you are truly passionate about, he would say, haven’t you noticed? I did have wonderful incursions into the culinary field in the past. Right after we got married and moved to Texas, I taught Mexican cooking to friends and neighbors. Then, I became a production assistant for the PBS food series New Tastes from Texas hosted by Chef Stephan Pyles, along with guests Diana Kennedy and Patricia Quintana, pioneers who helped introduce Mexican ingredients into American cooking. Once we moved to DC, I retook my formal path as a political analyst and received a master’s degree in Latin American Studies from Georgetown University. I worked so hard, I got a merit scholarship and felt very proud. Soon after, I worked at the Inter American Dialogue, a policy research center, which I had considered my dream job, and kept on working even harder! Yet, I got into an existential crisis of sorts… Obsessively thinking about food rather than politics, after a year, I registered for an intensive night program at L’Academie de Cuisine in Gaithersburg, Maryland. After a lot of hesitation, I decided to take a plunge, and left my job to give food a real try. Since then, I have never looked back. In 2007, prompted by the Director of the Mexican Cultural Institute in Washington, D.C., I launched Mexican Table. Mexican Table is a culinary program that consists of a series of live cooking demonstrations and tasting dinners in an attempt to swing a window wide open into the fascinating world of Mexican cuisine. Since I wanted to share so many stories and information on things I know and love, as well as the things I continue to explore, experience and learn, I started this website, originally with only the food blog. As time passed, I started writing for print publications and got invited to give talks and do demos for radio and TV outlets. And super long story short, I started working on the PBS series Pati’s Mexican Table. 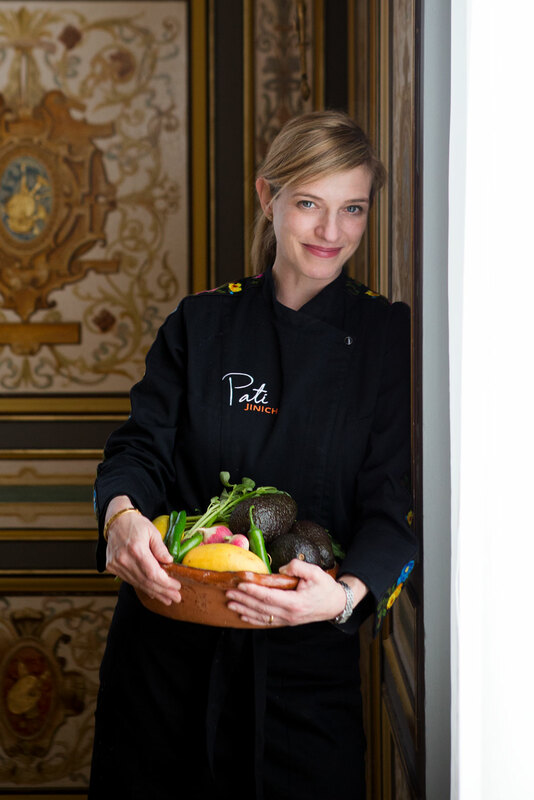 Today, Pati’s Mexican Table is a national public TV series going on its eighth season reaching an audience of 31 million people in the United States. It received the James Beard Award for Outstanding Personality/TV Host in 2018 and the Imagen Award for both the Best Reality Show in 2018 and Best National Informational Program Award in 2016. It has also been nominated for the James Beard Award for Best Culinary Series in a Fixed Location twice, in 2016 and 2017, and for two Daytime Emmys for Outstanding Culinary Host and Outstanding Culinary Series in 2016. It can be seen on television throughout the United States, Canada, Australia, Japan, Southeast Asia, India and South Asia. It can also be streamed anytime online on Amazon. On this website, you will find the original blog section, where I regularly write. But, you will also find a TV show section, where you will find information on the TV series and every recipe from every episode in every season. You will also find a cookbook section, where you will find information on my cookbooks, Pati’s Mexican Table: The Secrets of Real Mexican Home Cooking, published in 2013, and Mexican Today: New and Rediscovered Recipes for Contemporary Kitchens, published in 2016. Each recipe included in my blog, TV series and cookbooks exists because I love it. I test every recipe until it becomes a magic potion that anybody can make, whether it is for my classes, episodes or family meals. Having lived in the United States for more than twenty years, I understand some of the challenges of raising a family here and putting a meal on the table for sometimes picky eaters. I also try my best to make each class, each episode, each blog post as meaningful as I can for those who take the time to connect. In sum, through my site, TV series and cookbooks, I will tell you what happens before and after a scrumptious dish shows up at my table: the research, trips, stories, testing, cooking, eating and sharing. I hope it is a worthwhile effort, and you get as much pleasure reading it as I do writing it! I feel very blessed and grateful that you have taken the time to stop by, here, on my online home, or have allowed me to come into your home, through my TV series or recipes. ps… If you like what you read and see here, I am delighted! But if you want to use and publish any of the content or photos, please ask beforehand and link to this blog. Many thanks.